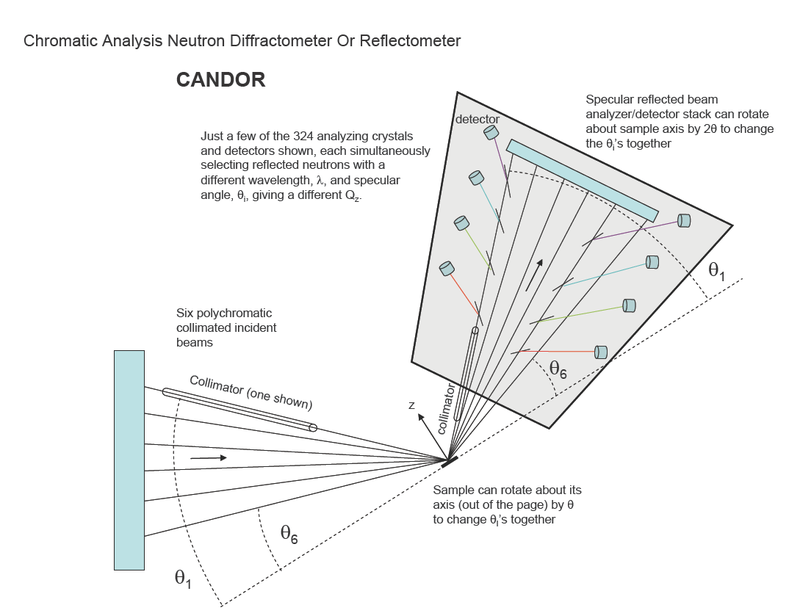 The problem: Using neutrons incident at angle q and having a single wavelength l, neutron reflectometry provides structural information, i.e., the scattering length density, along a direction perpendicular to the plane of a thin film or a multilayer sample (the z direction). Even at a glance, the positions of the “bumps” in the reflectivity pattern as a function of the scattering vector component Qz along this direction yield the film thickness or the interlayer spacing, and smearing of the bumps tells you that the layer surfaces are rough. More interesting features emerge through detailed analysis of this raw pattern. Of course, in order to have any neutrons at all in the beam, you have to allow a spread of wavelengths to be incident. On the other hand, if you try to reduce the measuring time by allowing too broad a band of wavelengths (a polychromatic or “white” beam) of neutrons to be incident at this angle, then even the pattern from a perfect set of uniform layers would be smeared out, since all the wavelengths are reflected at the specular angle. The angle theta is no longer tied to a unique value of Qz = 4 pi sin(theta)/lambda. But what if you could cleanly measure the wavelengths of the scattered neutrons? Then you would know the values of Qz and recover the pattern with a reduction in measuring time commensurate both with the increase in flux and number of Qz values extracted simultaneously. The CANDOR solution: is an instrument in which collimated polychromatic beams at six discrete angles theta_i are incident on a vertical sample, and the reflected beams are collimated to be collected at the corresponding specular angles. Here’s the twist: along each of these six reflected beam paths there is a series of 54 analyzing crystals set to deflect neutrons of one particular wavelength, allowing the neutrons having other wavelengths to pass through to the other analyzing crystals down the line. For each of these analyzing crystals along each path (324 of them) there is a detector collecting data at the same time as all the others. In this way data from 324 distinct values of Qz are collected in one swoop. To cover all the Qz values of interest, both the sample and specular reflected beam (analyzer/detector) stack can be rotated about the vertical sample axis to change theta and hence Qz (theta - two theta rotation). Return to the Instrument page. Return to the Expansion page.